The IND Second System plans included a subway extension past 76th Street to Cambria Heights near the Nassau County border. For students of the history of New York City and its subways, abandoned stations and half-built shells offer up an alluring reminder of what was and what could have been. Scattered throughout the city are various platforms now shuttered and lost to the era of longer trains, and of course, the provisions that remind us of the grand plans for the IND Second System capture the imagination. We know of the shell at South 4th Street and a similarly hidden one at Utica Ave. But what of the other subway mysteries? One long-standing urban rumor has concerned a station along the IND Fulton line just east of Euclid Avenue and past the walls that mark the end of the C local train. This is the 76th Street station, an urban fable kept alive by an old April Fools joke, some mysterious construction barriers and track maps that hint of an unbuilt subway extension. The 76th Street station itself is a mystery. If it exists, it would be found at the area of 76th Street and Pitkin Ave. in Queens. Officially, it was never really built, and no one has photographic evidence of it. But there’s long been lingering doubts in the minds of even the most ardent subway historians. The immediate tale of 76th Street begins where many subway legends start: on SubChat. A recently revived thread from February covered the discussion of a potential C extension down Pitkin Ave., and one person claimed to know someone who had the seen station. The topic comes up now and then, and in 2001, rumors of the station’s existence were prevalent. What we know today are snippets of rumors and in complete images. The story is fueled by a cinderblock wall past Euclid Ave. and a signal that’s facing the wrong way. For some reason, subway construction crews at one point decided to brick up the area at the end of the local tunnel, and all that remains are stubs on track maps and signal schematics. A 2007 post by the LTV Squad simply fueled speculation, and like any good urban legend, the story doesn’t die. Early in the decade of the double aughts, two subway historians brought tales of the 76th Street station to light. In a comprehensive posting on April 1, 2002 that included some excellent Photoshops, Joe Brennan created a history of 76th St. He even claimed the station had been in revenue service but was shuttered as part of a city cover-up. That, of course, was an April Fools joke, but Randy Kennedy’s 2003 column on 76th Street was no laughing matter. Kennedy spoke with one man who insisted the station exists, and his evidence was similar to that found by the LTV Squad. An electric board says 76th Street; the cinder block wall is an oddity; other transit workers and police officers claim the station exists on the other side of the wall. It’s a case based on circumstantial evidence, but until someone returns with photos, 76th Street will remain forever a debated part of subway lore. And yet, we do know what was supposed to go past that cinderblock wall sixty-plus years ago. As part of the IND Second System, the Fulton Line was to split near Euclid with one section continuing along Liberty Ave. and the other heading east to 229th St. in Cambria Heights, right near the Nassau County line. Some plans called for the IND to use the LIRR right-of-ways, but the details are immaterial. Eventually, due to costs and some engineering concerns, the plans for such an ambitious extension were scrapped. It is true that a signal schematic references the “future 76th Street interlocking,” but that is ultimately a future that never came to pass. The last few months have been kind to underground explorers who poke around in areas off limits to the city’s law-abiding citizens. After the Underbelly Project drew headlines and arrests, urban exploration has become the next great Internet fetish. This past week, The Times and NPR profiled Steve Duncan of Undercity who, along with Andrew Wonder and Erling Kagge, took some reporters to a few of the city’s more hard-to-reach spots. Among those were, of course, some areas of the subway. In the video above, the explorers go underground with a camera, and the 30-minute clip is stunning. The first part has them walking the tracks late at night to reach the old abandoned City Hall stop, and the video footage will leave your jaw on the floor. Of course, what the three explorers and the reporters did is illegal. So do not try that on your end. Cops will be watching these tunnels. For more, check out the articles in The Times and on NPR.org. Intrepid urban adventurers who set off in search of the South 4th Street subway station and the Underbelly Project art gallery are finding themselves greeted by a not-so-pleasant surprise. As Michael Grynbaum reports, around 20 people have been arrested for trespassing as they’ve set off in search of the hidden art project. The abandoned station sits directly underneath Brooklyn’s 90th Precinct station house, and as the MTA is trying to discourage illicit trespassing, a team of cops, including some of the plain-clothes variety, have been staking out the joint. So far, most of those caught have been charged with criminal trespassing while two received transit summonses. “This is not an art gallery; this is completely illegal,” one police officer said to The Times. While the Underbelly Project curators claimed they destroyed the entrance point to the South 4th Street station, that claim is far from the truth. It is still physically possible to get up there, and those who have eluded the police found that the locals have tagged the art. For its part, the MTA reiterated its stance it will not be erasing anything on the walls, and the authority has already sealed off one of the site’s easier access points. Amusingly enough, the authority also refused to confirm the location of the gallery to Grynbaum and The Times. “There are some bloggers who can pinpoint these places because they eat and sleep transit lore, but officially, no, we’re not confirming anything,” authority spokesperson Deirdre Parker said. It’s up there though behind chain-linked fences and well within the arm of the law. The Underbelly Project story hit the Internet like a wave on Sunday night, and as the story broke, it seemed clear that PAC and Workhose, the project’s curators, had told those who participated that they could talk about it on October 31. From a look at most of the pictures and some Exif data sleuthing, it appeared as though the photos taken by Luna Park and Vandalog were taken in late July and early August. It would only be a matter of time before the more adventurous and foolhardy among us tried to access the site. Recently, some intrepid urban explorers have taken the initiative to find the South 4th Street station and photograph it today. Bury Me in Brooklyn posted what they found on an excursion to the site earlier this week, and it appears as though local taggers have defaced the art. While some of the pieces have remained graffiti-free, many have been tagged over (1, 2, 3, 4). Yet, from the perspective of street art morals and artistic romanticism, the taggers shouldn’t have defaced the Underbelly Project. I’ve heard that locals were upset about the way PAC and Workhorse’s efforts drew both internationally famous street artists and such overt attention to what had been a relatively secret spot. Either way, it is a testament to the fleeting nature of this project, and while the MTA has no plans to erase it, time and other artists will take its toll. Let me take this opportunity to remind my readers that is both illegal and highly dangerous to access the South 4th Street station and the Underbelly Project area. It’s trespassing in off-limits MTA property, and the authority has repeated stressed how violators will be caught and prosecuted. Don’t do it. As a kid of New York growing up near Broadway on the Upper West Side, I knew about the 91st St. subway station, which closed 34 years before I was even born, long before I had a sense of the subway system as a whole. My parents told me how there used to be a 1 train stop — then the IRT local — on the same corner as my childhood apartment building. I knew that if you peered hard enough into the dark, you could see this graffiti-covered, trash-strewn relic of another era, and my parents told me that when the 96th St. station finally reached 94th St., the 200-foot stop was deemed unnecessary. It shut with little public fanfare. Today, the 91st St. station exists as nothing special. 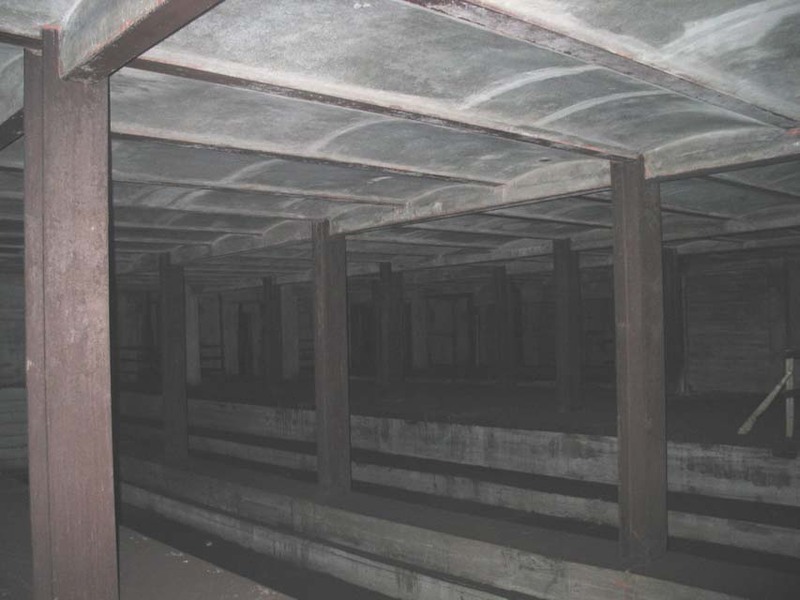 Before 9/11, the Transit Museum conducted tours of the stop, and the photos show neglect and destruction appropriate for a station that hasn’t seen revenue service since the waning days of the Eisenhower Administration. There’s no need for this station, and so it, like many others, passes into the forgotten realm of New York City subway history. Earlier this week, that history exploded onto the front pages of The New York Times when the Underbelly Project, my latest subway obsession, became public. Not technically located in an abandoned station, the street art gallery inaccessible to anyone but the select and the daring inhabits a shell station built off of the IND Crosstown’s Broadway stop that has been waiting for trains to pass through it since the early 1930s. The subway, though, will never come to the South 4th St. station, once the six-track centerpiece for the grand plan we now call the IND Second System. Instead, a massive display of street art that has truly and utterly captured my imagination now lives there, and the MTA says that, while it will work to shore of this abandoned station’s security, it won’t erase the art. Why, I wonder, am I so drawn to this story? The answer I believe lies in the mystery of the station, nostalgia for an era of old when now-abandoned subway stations were open and the sweet romance of the way the city used to plan on a grand scale. By and large, the city’s abandoned subway stations are few and far between. For a public transit system with 468 active stations, New York City’s system has few hidden spots. The City Hall stop, visible to those who ride the 6 train around the loop and enjoy the perks of Transit Museum membership, is probably the most famous, but others — the 18th St. station on the East Side IRT, the Myrtle Ave. stop-turned-Masstransiscope just north of DeKalb Ave., the entire unnecessary Worth St. stop — are out there. The abandoned subway stops and unused lower levels — 42nd St. and 8th Ave., Bergen St. and 9th Ave. in Brooklyn — and antique walls remind us of the city’s past. The subway’s planners made mistakes. They built too many stops that couldn’t handle the appropriate number of riders a few years or decades after opening. They put stations too close together and constructed bi-level stops where they weren’t needed. In a few select spots around the city in the 1930s, they even built station shells for subway routes that never materialized. Each and every vacant spot is a reminder of a bygone era in the city’s transit history. This week, it will become harder for the urban adventurers to find these hidden gems. The MTA and the NYPD are working to ensure that access to the abandoned and forgotten stations isn’t as easy as it was for the two years while street artists toiled away at the Underbelly Project work. Hidden access points will be sealed, fences will be mended. Yet, these stations are out there, decaying reminders of another age. History may not remember them, but those of us who know and appreciate transit history will. With their work this week, the Underbelly Project and its slate of artists made sure that many more of us now know that history. The Shadow Machine from Jason Eppink on Vimeo. When news leaked of the Underbelly Project gallery at an abandoned subway station somewhere in New York, I assumed that the MTA would quickly identify the site and shut down porous access. It took of us intrigued by and obsessed with abandoned stations just a quick glance to identify the gallery site as the South 4th Street station, and today, I was able to confirm that the art is indeed in this IND Second System shell station. The MTA figured it out too and pledged better security. Meanwhile, I learned this morning as well that an MTA work crew went into the old South 4th Street station to explore the site. They were spotted entering the shell at the northbound end of the Broadway stop on the G train, and Donovan told me that the authority’s crews are working to identify potential access points and to seal up these abandoned areas. “New York City Transit staff were on site today to assess the station’s security and make some adjustments to make it more secure,” Donovan said. As the video above from Jason Eppink — the artist behind this summer’s Spoiler Alert signs and a 2008 subway chair installation — shows, it is indeed dark and dangerous, and it appears as though at least one site access point requires walking along or through subway tracks. More scenes from the makeshift gallery have reached the Internet as well. Wall Kandy offers up a blog post and a flickr photo gallery. These photos are from July 30-August 1, and I have to wonder what time and other graffiti artists have done to the project in the intervening three months. When news of the Underbelly Project’s subway station art show hit the Internet this weekend, subway lovers scrambled to adduce the site and quickly settled upon the South 4th Street subway shell. This is a six-track, IND station in South Williamsburg hidden from the public but identical to the station seen in the photos presented to the public by the Underbelly Project. To the uninitiated, this stop may sound like a phantom subway station. Isn’t the only 4th Street station at West 4th in Manhattan? What is this South 4th Street station? Where is it? And where do the trains that once serviced it go? The answers — especially to the last question — are tricky. The South 4th Street subway station isn’t anything quite like the city’s other abandoned stations. It’s never seen revenue service before, and in fact, it doesn’t even have a rail track running through it. It exists in fragments — poured concrete, unfinished stairwells, no lighting, no through tunnels — and is a remnant of an era of larger plans. In a sense, it’s not an abandoned station because no trains ever served it nor could they. Rather, it is an abandoned dream. The South 4th Street was to be a major transfer and connection point for the IND Second System. The shell was built into the ceiling of the Broadway stop on the IND Crosstown — a so-called provision statement — before the city even knew if funding for the remainder of the line would ever materialize. When World War II and the subsequent advent of the automobile age put a grinding halt to subway expansion, the South 4th Street shell remained just that. It is a testament to another era, behind false walls and closed-off staircases, and today, it apparently housings one of the largest street art exhibitions in New York City. Today, a six-track station seems unimaginably wasteful. The MTA is building the Second Ave. Subway with only two tracks due to budgetary constraints, and the only other stations and tunnels with six tracks — Hoyt-Schermerhorn comes to mind — never make use of the full array of options. The two outer tracks at Hoyt-Schermerhorn lead into the Court St. stop which we know today as the Transit Museum. It too was part of the grandeur of the Second System and a planned Brooklyn extension for the 1930s edition of the Second Ave. Subway. But back in 1929 and again in 1939 when the city was trying to build up its subway system, South 4th Street in South Williamsburg was to be a major intersection. The plans are aggressive: Both the Sixth Ave. and Eighth Ave. lines would have passed through this station, bound for multiple points east, south and north. The Second System, which I explored in depth in 2008, which have reimagined New York City, and the Second System’s Big Apple would be a more accessible one than ours is today. The 1929 expansion plans included three spurs from the six-track South 4th Street station. Click here for a full view. According to proposals from the era, the city considered a variety of routes into Brooklyn and Queens, but the Manhattan connections were the same. The Sixth Ave. local would have run the route we know today, but from Second Ave., the trains would have continued east. In fact, the stub tunnels on the two middle tracks that extend eastward past the Second Ave. stop are a provision for the route that would have led through South 6th St. The other part would have swung the Eighth Ave. local up Worth St., past the current Essex St. East Broadway stop, across the East River and to South 4th Street. Eastward out of South 4th Street, the possibilities were twofold. In the 1929 plan, one set of tracks would have led down Stuyvesant Ave., crossing the IND Fulton St. Line at Utica Ave. — where another shell station and some unused mezzanines live — and continuing down Utica Ave. and to Marine Park. The other spur would have led up Myrtle Ave. where the line would split again. This time, one route would have allowed the Queens Boulevard line to connect to the Rockaways via Fresh Pond Road, 65th Place and 78th St. while the other branch would head out to the Rockaways, a branch eventually realized by a more modest extension of the Fulton St. Line. We used to dream big. The subway expansion plans from 1939 show where the shell station at South 4th Street crosses over the G line. Click here for a full view. Today, we think small and build small. Once upon a time, New York left stations unbuilt as shells for future expansion. It was cheaper and easier to build a shell at the South 4th Street transfer point than it was to build around a preexisting subway station. Now, we build just a two-track extension along Second Ave. and scoff at the notion of a Second System-like expansion in the 2010s. Imagine this part of Williamsburg as a major transfer point from the G to Manhattan, from Queens and Brooklyn into Manhattan. It’s what could have been and never was, and all that’s left is an abandoned shell of a subway station and some crazy photos of the remnants of an era when we tried to plan ahead. Once upon a time, in the late 1970s, the subways were covered with graffiti that many considered art. This wasn’t the sloppy graffiti tags of today that involve a scrawled name or an uncreative expletive. These were full-car murals, sometimes with messages, that took time, skill and a certain willingness to spit in the face of authority. Today, even as we are commemorating early-1980s graffiti, we still debate whether these markings are art, vandalism or some mixture of the two. In early 2009, a project began four stories underneath the skin of New York. 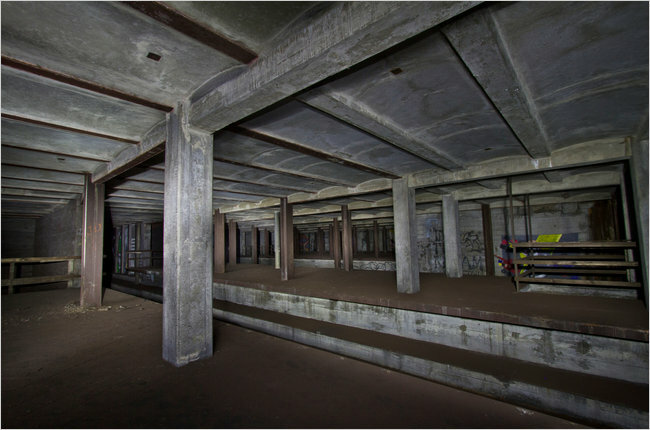 For nearly 100 years, a massive subway station sat unfinished, unused, and undiscovered. Over the course the last year, artists have been secretly escorted into this station to leave their creative mark. Unobstructed by the pressures of commercial sales, phone calls, or daily routines, each artist painted for one full night. The Underbelly Project is the result of the past year. At the close of the project, the entrance was removed and darkness reclaimed the space once again. A vast new exhibition space opened in New York City this summer, with a show 18 months in the making. On view are works by 103 street artists from around the world, mostly big murals painted directly onto the gallery’s walls. It is one of the largest shows of such pieces ever mounted in one place, and many of the contributors are significant figures in both the street-art world and the commercial trade that now revolves around it. Its debut might have been expected to draw critics, art dealers and auction-house representatives, not to mention hordes of young fans. But none of them were invited. The piece goes on to talk about the artists who agreed to participate. 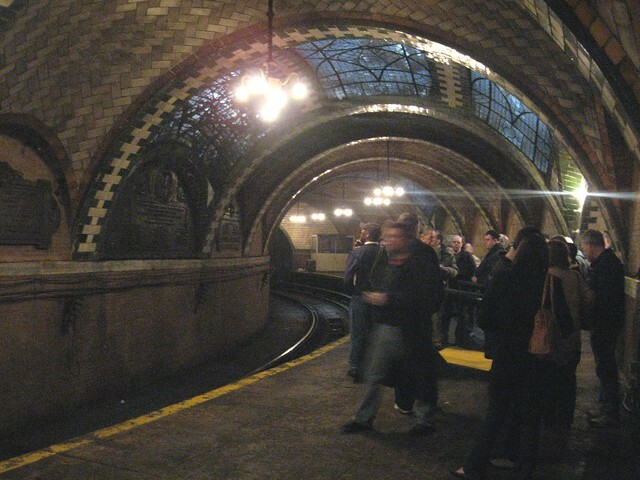 Some came from as far as Europe while many were New Yorkers who jumped at the chance to explore this subway station. 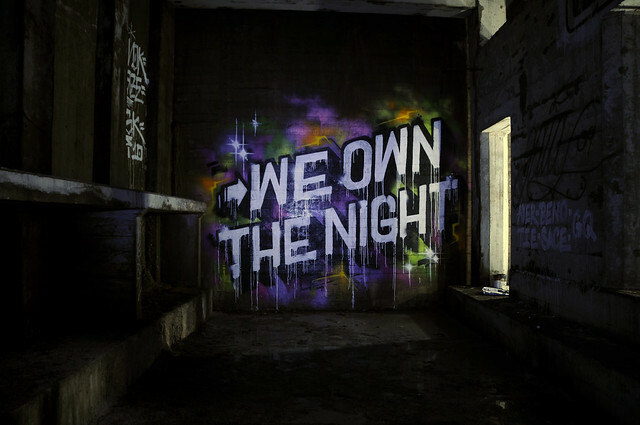 Rees also details, in broad strokes, how the artists accessed the spot, how they turned this dark and dank walls into a canvas and why Workhorse and PAC chose this site and had this image of it. Some time soon, the two curators will unleash on the world a list of the artists and pictures of the work. For now, we’re left with an extensive gallery on Luna Park’s blog and The Times’ own gallery. It’s quite a glimpse into a part of New York City few, if anyone, will ever seen, but it’s enough to tell those of us familiar with the subway system where it is. Based on the visual evidence, it is in the never-used, once-built shell of a subway station at South 4th St. and Broadway in Brooklyn. I traced the unique origins of this long, lost part of the Second System two years ago, and Subway & Rail has a full gallery of this station online. Built in an age when the city built shell stations for cheap with an eye toward future expansion, this shell has set empty since the day the concrete was poured. Rumor has it that one can access the station via the G train stop at Broadway with the appropriate key. It is a dangerous thought about a morbid project that somehow captures both the recklessness of a bygone era, the foolhardiness of this undertaking and the mystery of an abandoned aspect of the New York City subway system. I don’t think Arts for Transit will approve.